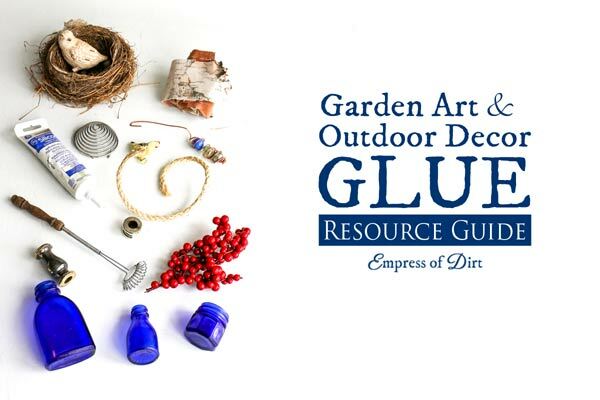 This guide helps you choose the right adhesive glue for your outdoor garden art and decor projects. Find out which products give long-lasting, waterproof results that last throughout the seasons. For a good beginner project, consider making a decorative garden art ball. 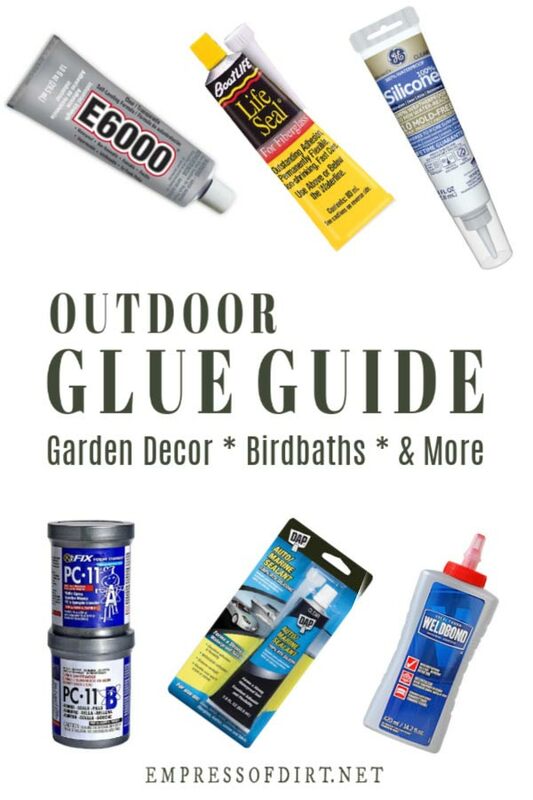 With hundreds of glues available, it can be difficult to choose the right one for your project. 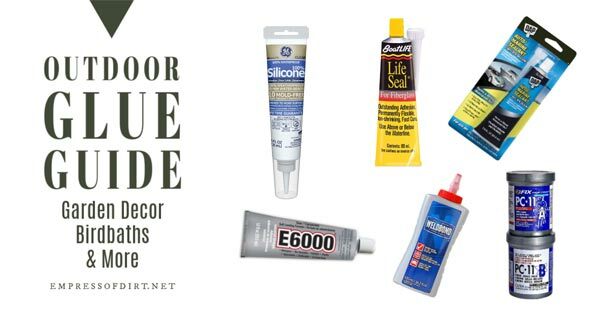 While no glue is perfect for all applications, there are a few top picks that work for most applications. In this article, we use the words adhesive and glue to mean the same thing: any product used to bond two surfaces together. Some of the products are not actually sold as glues but are marketed as sealants yet still provide the desired results. If you need a glue that can be submerged in water, scroll down to the products at the bottom of this article. The glue ratings below are opinion not science. I did not go buy every single glue product, make dozens of projects, and test them through the seasons for several years. Although that would have been fun. Instead, I am sharing my experience and opinions from others. I checked forums, books, and advice from other garden art makers. Once we find a product that works, we tend to settle in and use the same thing repeatedly. If you have experience or an opinion to offer, I would certainly like to hear it as well. It is also not unheard of that two of us with the same product have different experiences or outcomes. This could be due to variations in the actual product. Older glues or glues that have been stored in extreme conditions tend to separate and no longer work effectively, so keep in mind that fresh is best (check for best before dates). You must prepare your surfaces before applying glue to ensure they are clean and grease-free. As mentioned, there is no perfect all-purpose outdoor adhesive but there are a few top picks for garden art makers. Weather-resistant: look for sun and freeze-proof (UV stability, temperature, and weather resistant). Waterproof or resistant: Label should indicate if glue is suitable for use above or below the waterline. Above-waterline adhesive means your project should not sit in water, but can withstand rain. Just because a glue works below the waterline (after curing), does not mean it is safe for fish or birds (in a pond or birdbath). Durable: Does not crack or shrink with age (remains flexible once cured). Long-lasting: Good news. Once cured, most of these products are impossible or very difficult to remove. Clear-drying: Many product labels say ‘clear-drying’ but the glue is actually opaque when cured. I have noted this below in the product rankings. Precautions: All these products come with instructions for safe handling and first aid. Follow all precautions and keep safe. Paintable: Just a few glues are paintable. Keep this in mind if you will want to paint yours. Groutable: If you’re doing mosaics, keep in mind that grout does not stick to most glues when cured. You can still use them but be careful not to get the glue in the areas that will be grouted. Read the entire product label first including instructions and safety precautions. Clean: You want your materials clean and grease-free including removing any oil from skin contact. Washing and drying the materials is often enough. The ultimate degreaser is methyl hydrate. You could also use denatured alcohol. Sand: Glue surfaces should be rough (not smooth). Use sandpaper anywhere the glue will be applied to give the surfaces ‘bite’. 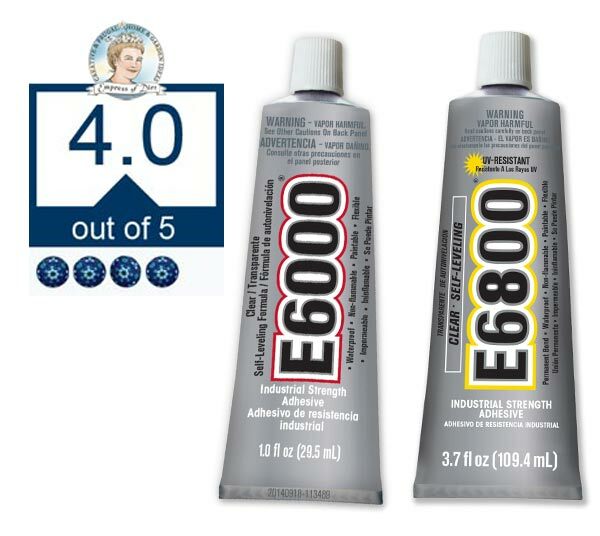 These ratings only apply to garden art applications, not the intended uses for these glues. Adheres to glass, ceramics, aluminum, stainless steel, wood, masonry, brick, concrete, painted surfaces, vinyl, plastic, and more. Projects ideas include garden balls, totems, glass gems art. Can use for mosaic tiles but do not apply where grout goes. Not recommended for anything that will be submerged in water (ongoing) such as birdbath bowls, water feeders. Notes: This product is permanent, cannot be painted or grouted, and dries opaque, not clear. More tips for using this product: GE Silicone II Sealant | Answers to frequently-asked questions. 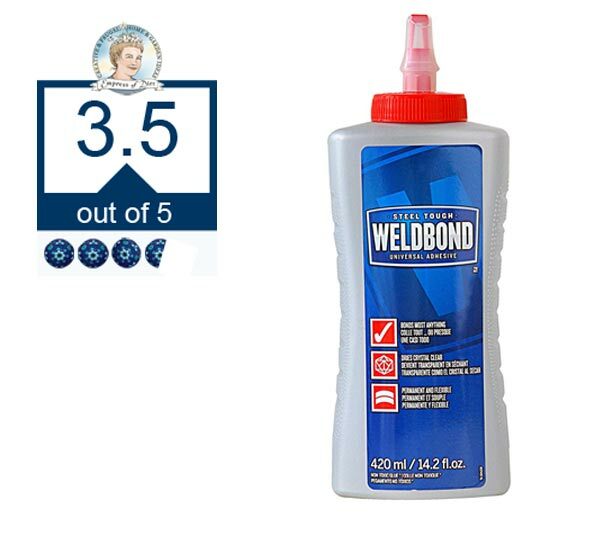 This silicone sealant that also works as a glue (bonding and adhering). It is available both in squeeze tubes and larger tubes requiring a caulking gun dispenser. There are numerous variations of this products so read the label carefully to make sure you’re buying the right stuff (you can see a closeup of the right label here). Look for: outdoor use, waterproof, clear-drying. I use the one for gutters and flashing. Clean up (while wet only): mineral spirits. Adheres to glass, ceramics, plastic, metal, ABS, PVS, copper, vinyl, rubber, brick, wood and more. Project ideas include garden totems, glass gem garden art. Can use for mosaic tiles but do not apply where grout goes. Not recommended for Styrofoam™, polystyrene, polyethylene or polypropylene plastics. Notes: This product is permanent, paintable, and dries clear. It’s a thinner, somewhat runny glue so you have to hold things in place while the glue dries. Some people swear by this stuff; others say it does not work as hoped. E6800 costs more and has UV stabilizers for outdoor applications. Available as spray, squeeze tube, caulking tube, and in large paint can. Adheres to glass, plastic, metal, ABS, PVS, copper, vinyl, rubber, brick, wood and more. Waterproof – can be submerged in fresh and salt water after complete cure. Toxicity for wildlife unknown. Clean up uncured adhesive with acetone or citrus-based solvents. Project ideas include garden balls, totems, glass gem garden art. Some mosaic artists love this stuff: just don’t apply it where you want to apply grout. Under tiles is fine. 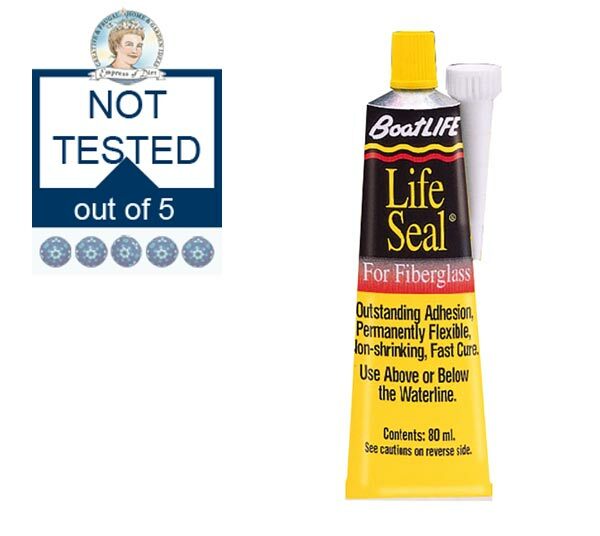 Not recommended for large projects because it’s not sold in larger, more economical tubes. Notes: Dries in 20 minutes. You may or may not like this, depending on how quickly you work. 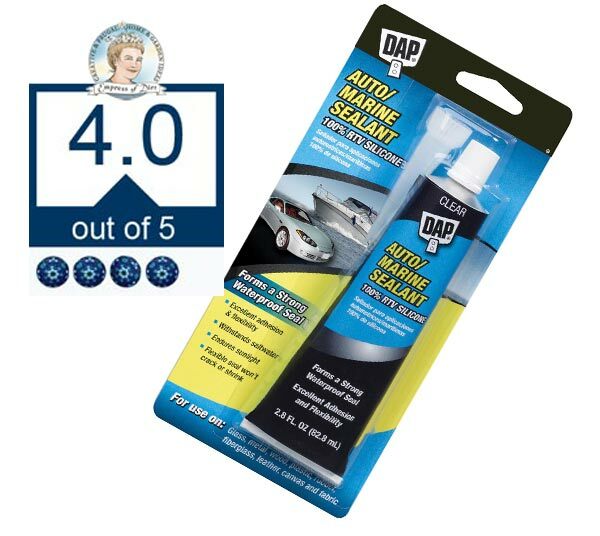 Long-lasting 100% RTV silicone rubber seals and bonds for automotive and marine maintenance and repair applications. Forms a strong waterproof and weatherproof seal. Stays flexible. Won’t shrink or crack. Resists vibration, expansion and contraction. Endures sunlight and withstands saltwater. Project ideas include garden balls, totems, glass gem garden art. Can use for mosaic tiles but do not apply where grout goes. Not recommended for vertical projects unless you can hold or secure materials while bond is forming. Notes: Somewhat runny and slow to dry. Some mosaic makers recommend it because it’s non-toxic (doesn’t stink while working). I gave it a lower rating due to mixed reviews from garden art makers. Sold in small volumes (too expensive for a big project). Format/dispenser is too difficult for crafting. Garden art makers report mixed results (some successes, some failures). 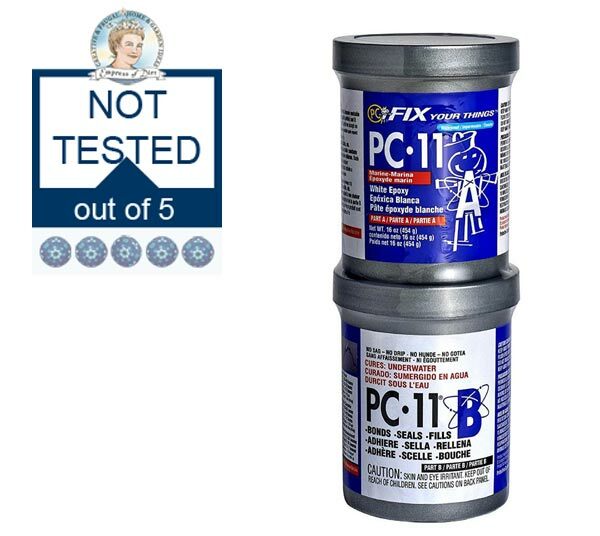 I have not tested these products but see them recommended for projects that will be submerged in water like bird baths. Check the product listings before buying to be sure they will bond your materials. Most marine glues still require dry application, and you must allow them to cure (per product label instructions) before submerging them in water. Because these products are not specifically intended for birdbaths or ponds, there is not information on possible toxicity for birds, fish, and other wildlife. I searched aquarium and pond discussion groups but could not find anything to indicate toxicity problems. I found some reports saying there were no issues. This is a small sample though so you will have to research it for yourself to decide whether you want to use them or not. Notes: Epoxies require mixing. Toxicity for wildlife not known. 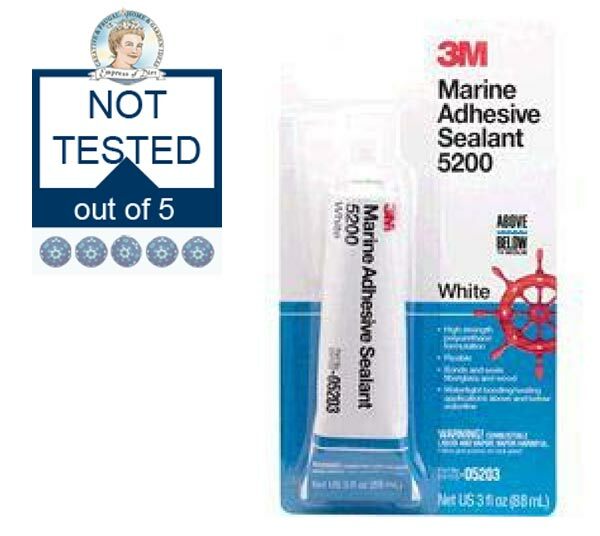 Two-part marine epoxy adhesive paste bonds materials in dry, wet, and underwater environments. Bonds many materials, including fiberglass, concrete, many metals, glass, ceramic, and rubber. Can be used in indoor and outdoor applications, with a temperature range of 35 to 115 degrees F and a service temperature range -20 to +200 degrees F.
High-tack paste can be used in vertical and overhead applications. Resists mild acids, caustics, detergents, gasoline, fuel oil, and fresh and salt water. Uses: bonds wood, gelcoat, and fiberglass. Notes: Cures in 48 hours. Toxicity for wildlife not known. Uses: bonds wood, plastic, glass, and fiberglass. Notes: Cures in 24 hours. Toxicity for wildlife not known. Ready to use the glue? There are lots of tutorials in the Garden Art Projects department here. I’m new to crafting outside glass, mosaic art. All the info on your site is so helpful. Looking forward to reading more! Hi Debbie no manufacturers test for wildlife safety. Marine epoxy bonds under water but effects are unknown. Doesn’t mean unsafe, just not tested. Thank you so much for this post. I will never have to google “glue” again! A time saver for sure. Excellent! Glad you found it useful. I needed it for myself too!